More than 100 of the wounded, including a photographer for the French news agency Agence Press France, were hit by live fire, the officials added, as the demonstrators burned tires, threw stones and flew flaming kites in the latest in a series of mass protests to call attention to a decade-old blockade of Gaza by Israel and Egypt. Israel says Gaza's Hamas leaders are using the protests as cover to carry out attacks. Late Friday, Israel said Gaza militants opened fire and struck an Israeli military post. No injuries were reported. The march coincided with the annual "Jerusalem Day," instituted by Iran to protest Israeli rule of the holy city. Israel and Iran have been archenemies since Tehran's 1979 Islamic Revolution. Since the near-weekly protests began on March 30, more than 120 Palestinians have been killed and over 3,800 wounded by Israeli army fire. 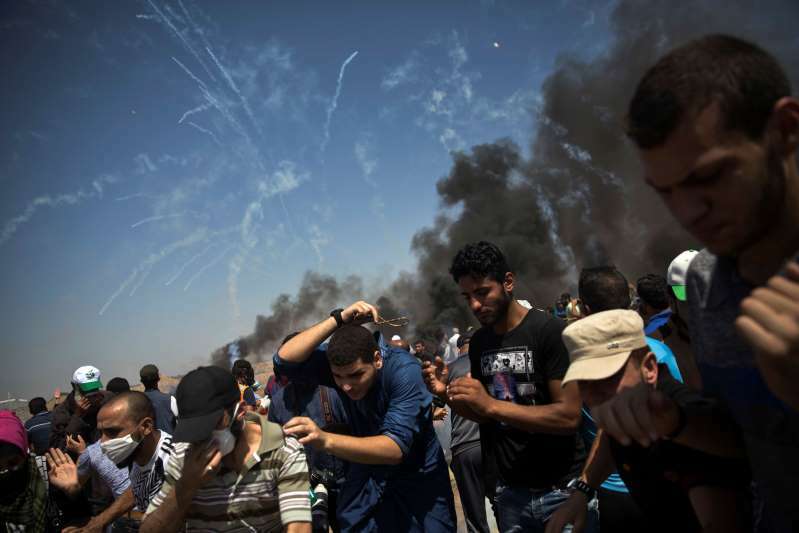 The overwhelming majority of the dead and wounded have been unarmed, according to Gaza health officials. Among the dead Friday was 15-year-old Haitham al-Jamal. His family said he was taking part in a protest in Rafah, in southern Gaza, when he was shot. A total of 12 children under age 16 have been killed in the protests. French news agency Agence France-Presse said one of its photographers, Mohammed Abed al-Baba, was wounded at a mass rally after Israeli forces opened fire. AFP said al-Baba was wearing a press vest and helmet about 200 meters (yards) from the border when hurt. It said he was wounded below the knee while trying to take a photo of a wounded protester after Israeli troops opened fire. The photographer's injury was not life-threatening, but he was to undergo surgery. Israel's military had no comment on the incident. After Muslim prayers at noon Friday, thousands of Gaza residents streamed toward five protest tent camps that were erected more than two months ago, each several hundred meters (yards) from the fence. From there, smaller groups walked closer to it. In a camp east of Gaza City, activists burned tires, releasing black smoke. Others threw stones or flew kites with burning rags attached, aiming to send them over the border and set Israeli fields on fire. Israeli troops fired volleys of tear gas, including from drones, that sent protesters running for cover. One man with a bullhorn shouted, "America is the biggest evil." At one point, seven activists in black-and-white striped shirts meant to resemble concentration camp uniforms from World War II approached the fence. "We want to remind the world that the Israeli occupation is committing the same massacres that the Nazis committed," said activist Ahmed Abu Artima. The attempt to draw a parallel between Gaza's suffering and the Holocaust was bound to draw angry reactions. Israel was established in the wake of the Holocaust, marks an annual remembrance day for the 6 million Jews killed by the Nazis and is home to the world's largest population of Holocaust survivors. In a statement, the Israeli military said protesters had launched dozens of kites and balloons with explosives toward Israel. It also said a number of "explosive devices and a grenade" were hurled during the protests and later said the military post had been struck by gunfire. "At the expense of the people of Gaza, the Hamas terrorist organization continues using terror in order to damage security infrastructure and harm security forces," it said, adding that troops had been reinforced along the border. The military escorted journalists to a sniper position along the fence along Gaza's northeast border. Crowds of several dozen Palestinians could be seen approaching the fence constantly, as soldiers fired tear gas to scatter them. Some Palestinians launched kites rigged with incendiary devices, which were intercepted by small military drones. Snipers, perched about 50 meters (yards) from the fence and protected by sandbags and concrete barriers, frequently fired warning shots into the air. The mass protests have been aimed at a border blockade imposed by Israel and Egypt in 2007, after the Islamic militant group Hamas overran the territory. The marchers have also pressed demands for a "right of return" for descendants of Palestinian refugees to ancestral homes in what is now Israel. More than 700,000 Palestinians were expelled or fled in the 1948 Mideast war over Israel's creation. Two-thirds of Gaza's 2 million residents are descendants of refugees. Protester Fadi Saleh said the frequent marches have helped revive sympathies in the Arab world for the Palestinians, but that more could be done. "We need real Arab support and solidarity with our cause," said Saleh, a student of Arabic literature who wore a medical mask against the tear gas. Israel's use of potentially lethal force against the protesters has drawn international criticism. Rights groups have said Israel's open-fire rules are unlawful. Israel has accused Hamas of trying to carry out attacks and damage the fence under the guise of the protests, and that it only targets instigators. Hamas leaders have threatened possible mass border breaches, raising concern in Israel that communities near Gaza might be at risk. The protests have largely been organized by Hamas and to some extent by the smaller Islamic Jihad militant group. Both have received political and financial support from Iran, but they also pursue their own agendas. Growing despair in Gaza over blockade-linked hardships, including daily power cuts and rising poverty, have driven turnout. Israel and Egypt argue that they must maintain the blockade to contain Hamas and other militant groups, which have built up arsenals over the years, including short-range rockets. Israel and Hamas, which seeks Israel's destruction, have fought three cross-border wars since 2008. The Jerusalem Day protests are being held each year on the last Friday of the Muslim fasting month of Ramadan. The day is known in Arabic as "Al Quds Day," a reference to the city's historic Arabic name. Israel captured east Jerusalem in the 1967 Mideast war and annexed it to its capital, a move not recognized by most of the international community. Israel's current government has said it will not accept a partition of the city as part of a peace deal with the Palestinians. Tensions were further heightened last month after the U.S. moved its embassy from Tel Aviv to Jerusalem in a step seen by both Israel and the Palestinians as siding with Israel on the most sensitive issue in the conflict. East Jerusalem houses major shrines revered by Muslims, Christians and Jews. The Al-Aqsa Mosque compound in east Jerusalem, the third holiest site in Islam, is built on the spot where tradition says the Prophet Muhammad ascended to heaven. The compound sits on the ruins of biblical temples and is revered by Jews as the holiest site of their religion. In Iran's capital of Tehran, thousands joined a Jerusalem Day march, chanting "Death to Israel" and burning a Trump effigy. In Iraq, thousands of Iran-backed Shiite militiamen in uniform marched through the streets of the capital of Baghdad, burning an Israeli flag and carrying posters of the late Iranian leader Ayatollah Ruhollah Khomeini and Supreme Ayatollah Ali Khamenei. Associated Press writers Ian Deitch in Jerusalem, Ariel Schalit in Kibbutz Nahal Oz and Amir Vahdat in Tehran contributed.